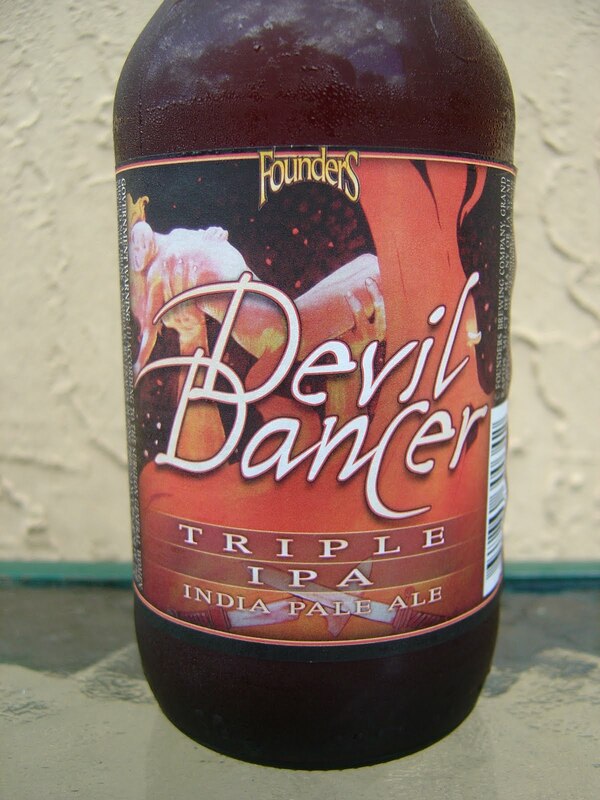 This evening I'm drinking Devil Dancer brewed by Founders Brewing Company in Grand Rapids, Michigan. Even though this brewery does not have a Florida presence, I've managed to get my hands on quite a few of their offerings. I've been quite impressed so far--all quality brews! This one (with three of his buddies) came home from my friend's Atlanta business trip last week. Thanks again! So the label depicts, um, I guess I'm not smart enough to figure it out. Stupid Cornell! There is a chick in a costume that appears to be being carried, and then a few knives in the foreground. Whatever, Picasso weirdo. Maybe it's a circus? 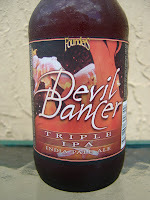 This is billed as a Triple IPA with 112 IBUs (1400 Maries). I've commented before that anything surpassing 1000 Maries is just ridiculous! Sweet, malty aroma yet also boozy with a touch of fruit and spice. Holy big bitter and astringent start. Pine tree Heaven in a bottle with just a little orange tree misplaced in that forest. 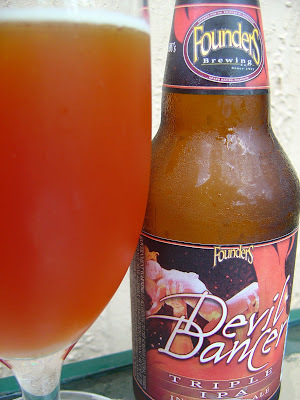 There is a sweet undertone, a little caramel and bread, and a thick consistency to this beer. But make no mistake that the bitter wants to be boss! The 12% (yeah 12%) alcohol provides a burny, warmy, hot, sharp kind of presence. And this beer is spicy as hell, too. Sticky mouthfeel, nice carbonation, with a bitter dry aftertaste that lasts forever. Great flavors, but by the end, the bitter alcoholicness caught up and got a bit annoying. Oh well, since this definitely ruined my palate for food for the rest of the night, I guess I'll keep drinking. And as I said, I have three left--who wants to trade? Nice beer to try if you have the opportunity. You tell me what the hell this label depicts. I too love Founders. In the same class as North Coast or Dogfish Head as far as I am concerned. I don't think I would like this brew...too much of "the bitter". Some guy said on Twitter that he didn't think it was as bitter as I portrayed it, but a little sweet at the end. Wait! Stop strangling me! Ouch! Just kidding. One bottle will help you decide.